Historic Sidewalk Cobble pavers, are beautiful hand-split cobblestone created hundreds of years ago for a foot-friendly surface. Monarch Stone International imports a tremendous variety of authentic antique 100 to 400 year old cobblestone pavers from Europe. One of the most special and rare, is an old cobblestone that was originally used in European pedestrian areas only. We’ve reclaimed only the best and have named this particular type of cobble, Historic Sidewalk Cobble®. Historic Sidewalk Cobble® are beautiful hand-split stones created hundreds of years ago for a foot-friendly, flat surface area used for sidewalks and pedestrian areas. This cobble has not been exposed to the dirt, oil, eventual asphalt that covered many cobblestone streets – so they’ve retained a fairly consistent shape and especially their gorgeous patina! Here in the U.S. this cobblestone is particularly appealing for home or commercial use on patios, walkways or other pedestrian areas, as well as for traditional stone driveway use. The natural color range appears slightly more vibrant because of the lack of heavy wear and exposure to roadway use over the centuries. The aged patina is uniquely warm and colorful. This particular cobble is only available in a square size: 5″ or 6″ and the natural height ranges from 2″ to 4″ high. As an option we can saw-cut the bottom for a consistent height of 1.5″ or 2″. Installation on a concrete base is recommended if being used for a driveway or heavily used area. Otherwise a sand base installation would be adequate with the natural height. Historic Sidewalk Cobble® are originally from the same historic stone quarries found in Europe that produced many other cobblestone shapes and sizes ranging from squares to rectangles. We call these other sizes simply antique ‘sandstone’ cobblestone vs. antique granite cobblestone. All of the antique cobbles in sandstone, granite or special types such as Historic Sidewalk Cobble, can be found on our website and more photos viewed in our gallery. 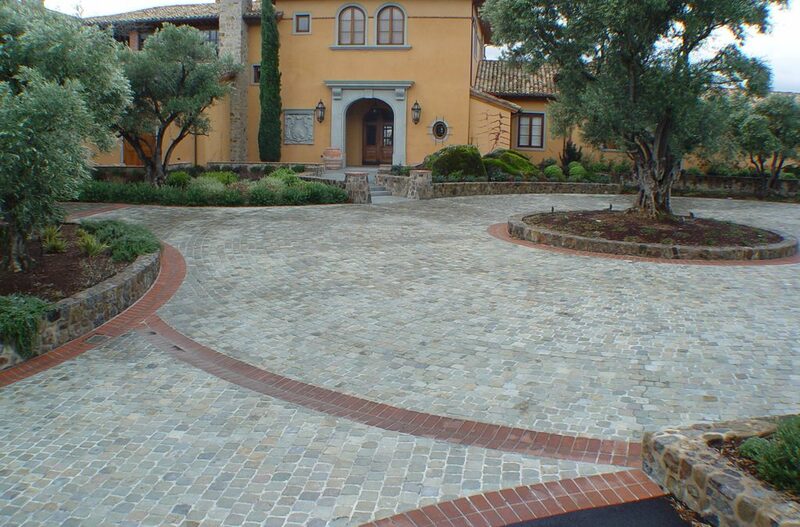 For more information about Historic Sidewalk Cobble®, give us a call today!